Since I have been on the subject of gardening this week I wanted to share a couple more projects with you in case you are out working in the garden over the next few weeks too! My kids are always in the garden with me and keeping them busy is always important. This year I have decided to give them their very own little space in the garden to play throughout the summer! 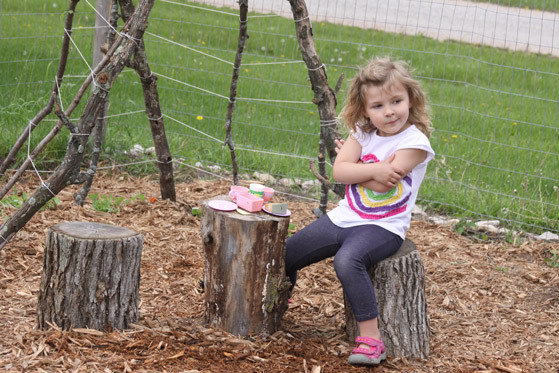 The best part is we made this play area out of nothing but stumps, branches, twine, and some mulch. It didn’t cost us a thing, and the kids are free to run, play, and hangout in their own space without stomping out the things we have planted. 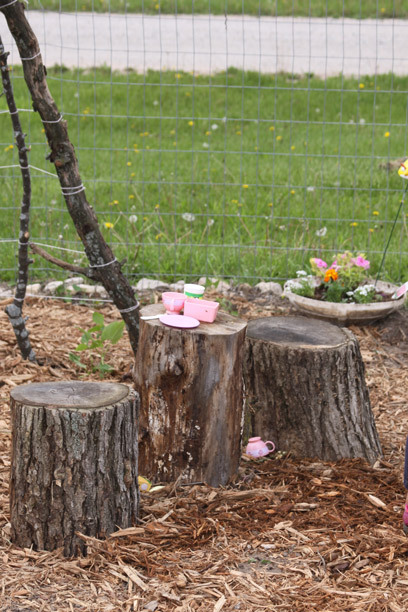 We created a very simple tea table from a few stumps that we had laying around, and it has been more fun for them that any toy you can buy! So, it really couldn’t be simpler! I am certain just by looking at the first picture you know exactly what I am going to tell you. If you need a great way to keep the kid’s busy in the garden while you pull weeds, and water plants – this is so simple and totally free! Skip the store bought tables, toys, and gadgets and go for simple, natural, and sturdy! Like I mentioned – I allotted the kids their own space in the garden this year and tried to make it into a sort of play house. 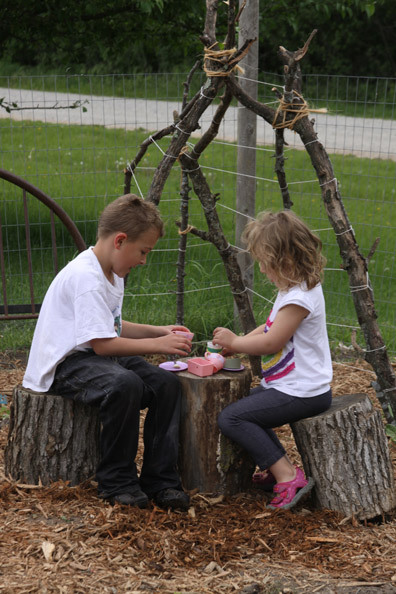 A place where they could water and care for their own plants, a place to sit and play, and a space that they can imagine and have some real, messy, fun! They even chose their own flowers to plant to decorate the space, and they planted many of the bean and pea plants that they started indoors in the spring. First I laid a couple of bags of mulch in the garden in a square shape, then I created a path to the center of the garden. This was basically my way of showing the kids where they could and couldn’t run and play. This way they know exactly where they shouldn’t walk to save our growing plants from getting stomped on. Then I pulled some big stumps out of a pile of wood from a tree we cut down last summer. I found stumps that were relatively the same size, with the center one being just a touch taller. 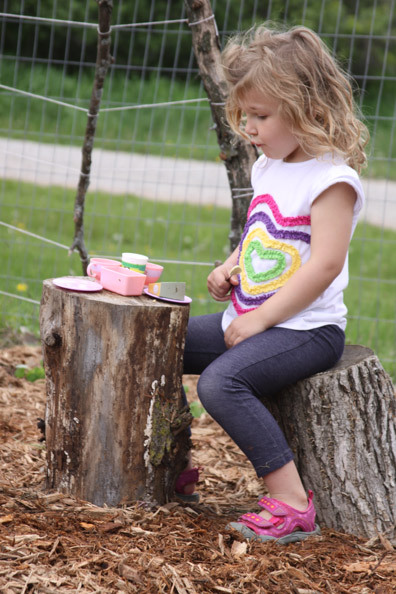 I tried to find stumps that had a larger base than top so that the kids could sit on them without tipping over all of the time. I then plopped the stumps in the middle of their mulched play area, and well… that’s pretty much it! Of course you don’t need a garden to make this for your kids, and in fact, had I put this in the grass somewhere I wouldn’t have even needed to lay down any mulch. This can go in any sized space, and be as simple as finding some stumps that fit the bill! We also created a super fun tee-pee that the kids can sit in and hopefully by the end of the summer it will be covered in plants that they can eat from! 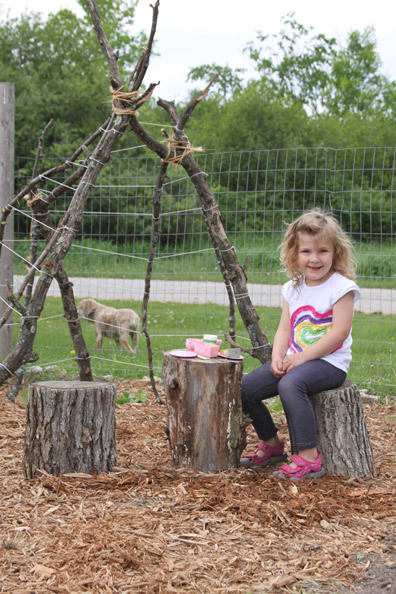 Of course the tee-pee made from branches in the background is pretty intriguing, and the kids can’t wait for it to be covered in beans and peas that they can eat, but I will tell you more about that tomorrow! 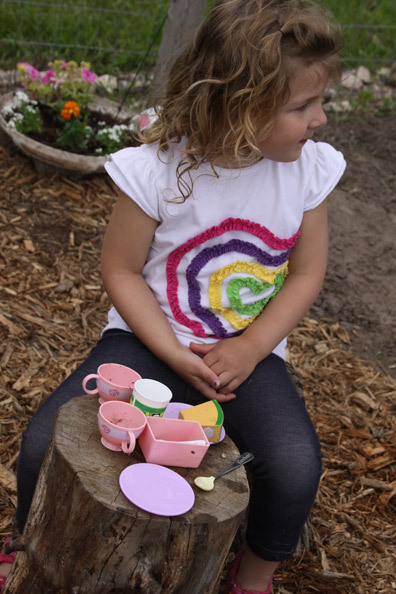 It really does add a great fun element to their outdoor play area though and it also cost me nothing to make! Once we had our table all set up I had the kids find a few little toys from their play kitchen in the house that they wouldn’t miss. The plan is for the toys to live outside the rest of the summer and be used to make mud pies, tea, and whatever else they want to make from the rocks, grass, sticks, mud, leaves and water in the garden. The kids love to fill a watering can and use it for making things, and I love that they are playing with almost nothing, but having so much fun! Watching them playing outside, using their little imaginations, and getting good and dirty makes me pretty darn happy and I can tell on a daily basis that it makes them REALLY happy too! Of course once this was all set up, it took just moments for them to get into play mode and start concocting all sorts of things together! Get outside, get creative, and get busy playing with the kids! Even if there is work to do first, they won’t know the difference if they have a fun space to hang out! It doesn’t have to cost a lot, in fact it doesn’t have to cost a thing to create a space they will love and enjoy and learn in too! Use what you have, where you are, and enjoy! Totally love this natural outdoor play area! This so looks like something my kiddos would put together. I’m going to share, pin and tweet this one. Hope it encourages simple outdoor play time!